Evgeni Nabokov’s first career NHL start was nearly perfect. On Jan. 19, 2000, the rookie goaltender from Kazakhstan stopped 39 shots for a shutout-tie against the Colorado Avalanche. The only thing missing from his first start was a win. Twelve years and 580 games later, Nabokov has 300 of them. 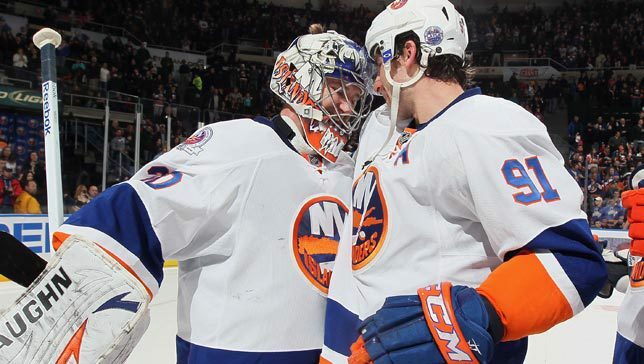 Evgeni Nabokov won his 300th career game on Saturday, January 14th at Nassau Coliseum. Click here for photos from his career. The milestone win came in dramatic fashion, a 4-2 victory against the Buffalo Sabres, in which Nabokov was called upon to stop 23 shots. With 1:24 remaining in the third period and the Isles up by one, Sabres sniper Thomas Vanek was awarded a penalty shot. The crowd was on their feet, chanting “Nab-by, Nab-by,” before the one-on-one showdown that saw Nabokov prevail. Nabokov played himself into elite goaltending territory. He’s the 26th netminder to win 300 games, ahead of legendary names like Ken Dryden, Ron Hextall and Johnny Bower on the all-time wins list. In his next six wins, Nabokov will surpass Mike Richter (301), Turk Broda (302), Olaf Kolzig (303) and Islanders legend Billy Smith (305). While Smith won 304 games with the Islanders, 293 of Nabokov’s wins came with his former club, the San Jose Sharks. He spent nine seasons in California, winning the Calder Trophy in 2000-01 and posting seven winning seasons. Nabokov won 40-plus games, three times, including a career-high 46 wins during the 2007-08 campaign. Paired with his 300 wins are 50 shutouts, an average of one shutout every six wins. A workhorse, Nabokov once started 43 consecutive games and has played up to 77 games in a season. His 300th win came in his 11th straight start for the Islanders. Only three active goalies have more wins than Nabokov: Roberto Luongo, Nikolai Khabibulin and the NHL’s all-time wins leader Martin Brodeur. The 36-year-old becomes only the second goalie to reach 300 wins in an Islanders sweater, joining Smith.